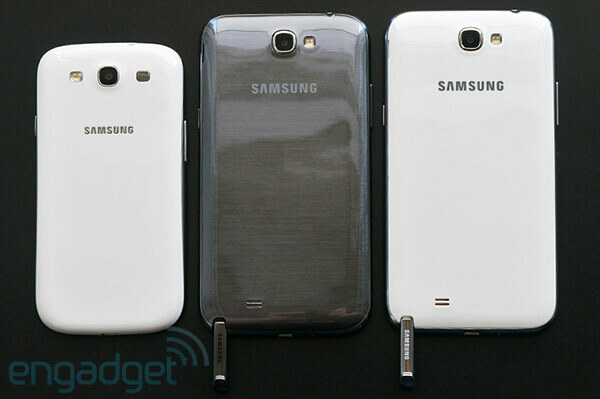 Samsung's got a handful of announcements to offer its mobile fans at IFA this year, and it's started big with the Galaxy Note II. The new Android device packs a larger 5.5-inch, 1,280 x 720 16:9 screen, but still falls roughly within the same generous footprint of its predecessor. A year on, we've now got a more powerful SoC, up from a dual-core 1.4GHz processor to a new quad-core 1.6GHz Exynos chipset (yes, that's even faster than the one found in the Galaxy S III) and Android Jelly Bean right out of the box -- not to mention this being the LTE model. Samsung's putting a lot of focus on making the most of all that screen space and S Pen functionality and we got our hands (both of them) on the Galaxy Note II just a few hours earlier, so after the gallery, skip past the break for our first impressions. 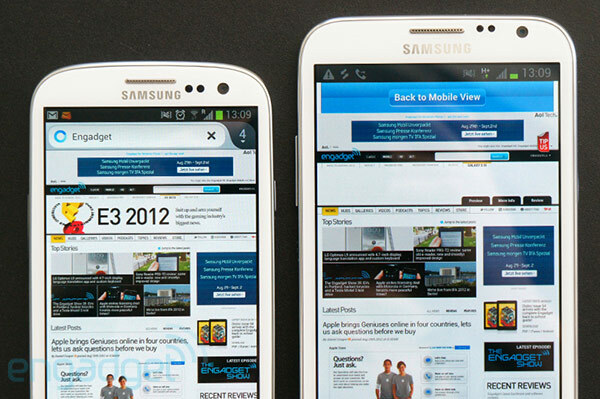 The Galaxy Note II speaks the same design language as the Galaxy S III, with a glossy shimmering plastic finish that envelops the back of the device, plus the same slim bezel. The button space below the screen has been slimmed down, as has the thickness of the device: 9.4mm instead of 9.7mm on the old Note. If you were able to hold the original Galaxy Note, there shouldn't be any problems here either. In the hand, the device feels just as solid as you'd expect considering its heritage -- it's impeccably well-built. Physically, there aren't many changes to talk about here -- ports and buttons are where you'd expect to find them, which is mostly a good thing, and the camera looks to be very similar to the 8-megapixel module we're familiar with -- with an LED flash and 1080p video skills. Instead, the big news is the refreshed S Pen and the extra software that goes with it. The stylus itself has been fattened out and lengthened to three-quarters of the device's length, making it easier to write with and its end is now rubberized to give it more pen-like friction on the glass screen. Pressure sensitivity is the same as on the new Galaxy Note 10.1, which means you get a full, art-friendly 1,024 levels of sensitivity instead of the old Note's mere 256. 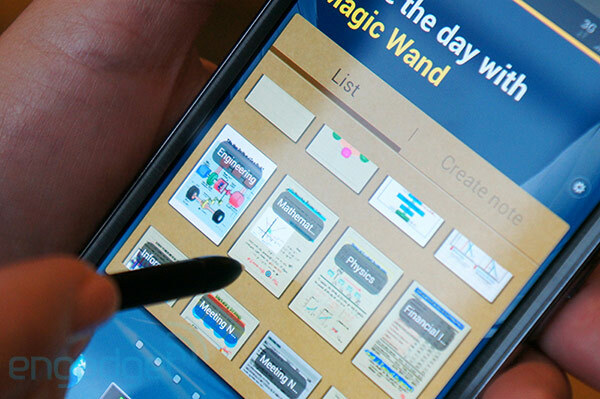 A great addition is the ability to recognize when the S Pen is removed from the device, which can trigger the app of your preference or the default note creation screen shown above. Equally, if you leave the stylus on a desk somewhere and try to walk off, the phone -- courtesy of its accelerometer -- alerts you to the fact that it's being moved without its buddy. The Note II has also been given "Air View" -- or the ability to detect the hover position of the S Pen, which opens up a whole world of new UI additions. These include a quick preview function, which can show the contents of a folder when you hover over it and before you actually tap into it. There's also a video preview feature which allows you to scroll through a video timeline to the section you want before tapping to go there. It all looked really fluid, although we're not sure we'll be navigating through our galleries with the new function all that much. Further productivity boosts include the ability to run S Note -- now called Pop-up Note -- on top of other apps, as a resizable window. 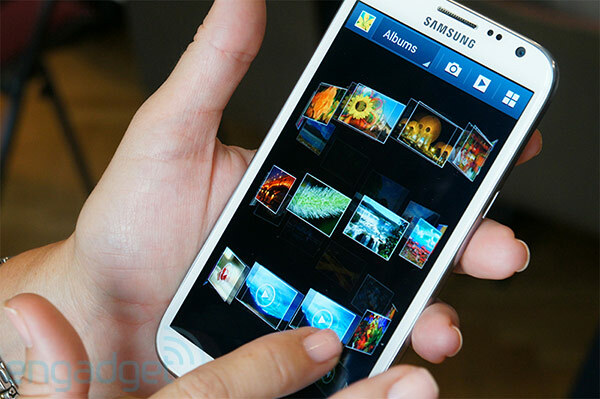 Pop-up video works the same -- it can now be resized and run over other apps, just like on the GS III. Interestingly, the email and calendar apps have been tweaked to recognize handwritten input -- for example, start a note with the @ character and it'll automatically put your completed text into an email ready to be sent. You can easily capture screen grabs using the stylus to mark out the grab area, and you can even record video of your onscreen activity. Samsung is giving nothing away in terms of pricing or availability, beyond saying the Note II will be available in Europe, Asia and the Middle East by October, and the US by the end of the year. It also tells us that it plans to add plenty more dedicated S Pen software (echoing the Premium Suite) in the future. As we burrowed into the Galaxy Note II's new features, it all felt simpler and more cohesive than the original -- less business and more pleasure. Big phone fans will just have to wait until we can put the new Note through a full test later this year, but so far, it's looking pretty good. Zach Honig and Sharif Sakr contributed to this report.